The 26th annual Aggie Classic champion Tate Aggies. 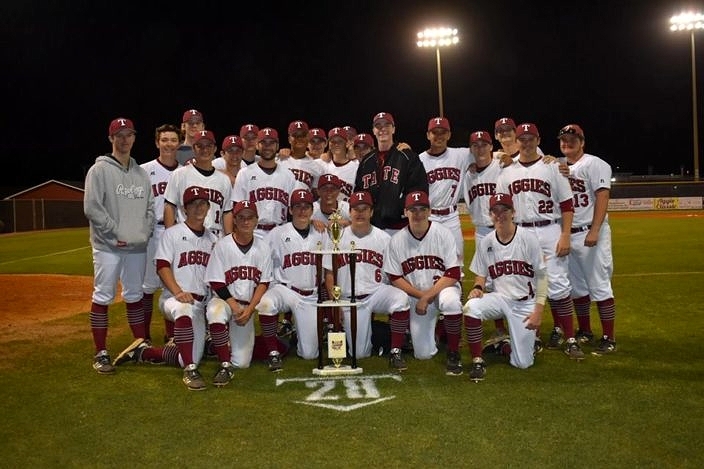 A two-run home run from Trey LaFleur provided the winning margin as the Tate Aggies rallied for a 5-3 victory over the Oklahoma Choctaw Yellowjackets, in Thursday’s championship game of the 26th annual Aggie Classic. Although they served as the road team in the contest, the host Aggies celebrated on their home field in adding another title in the tournament series. LaFleur’s blast capped a four-run fifth inning that helped Tate (7-1-1) erase a 3-1 deficit. Sophomore Jadon Fryman was hit by a pitch to begin the frame, and Michael Potts worked a walk to add another duck on the pond. Trevor Norton then dropped down a sacrifice bunt and reached on a throwing error that brought Fryman home. A wild pitch tied things up as Hunter McLean drew a free pass, and LaFleur connected on a 3-1 offering and sent it over the right field fence for the two-run home run that plated the winning runs. McLean also scored in the first to give Tate an early 1-0 lead, when he came home thanks to a sacrifice flyout from Darrien McDowell. Brantley Culbertson earned the victory, after allowing four hits and two walks in four-and-a-third scoreless innings of relief. He struck out three.